Screenshot of QEMU/KVM running NetBSD, OpenSolaris and Kubuntu guests on an Arch Linux host. Not to be confused with KVM switch. Kernel-based Virtual Machine (KVM) is a virtualization module in the Linux kernel that allows the kernel to function as a hypervisor. It was merged into the Linux kernel mainline in kernel version 2.6.20, which was released on February 5, 2007. KVM requires a processor with hardware virtualization extensions, such as Intel VT or AMD-V. KVM has also been ported to other operating systems such as FreeBSD and illumos in the form of loadable kernel modules. KVM was originally designed for x86 processors and has since been ported to S/390, PowerPC, IA-64, and ARM. KVM provides hardware-assisted virtualization for a wide variety of guest operating systems including Linux, BSD, Solaris, Windows, Haiku, ReactOS, Plan 9, AROS Research Operating System and OS X. In addition, Android 2.2, GNU/Hurd (Debian K16), Minix 3.1.2a, Solaris 10 U3 and Darwin 8.0.1, together with other operating systems and some newer versions of these listed, are known to work with certain limitations. Additionally, KVM provides paravirtualization support for Linux, OpenBSD, FreeBSD, NetBSD, Plan 9 and Windows guests using the VirtIO API. This includes a paravirtual Ethernet card, disk I/O controller, balloon device, and a VGA graphics interface using SPICE or VMware drivers. Avi Kivity began the development of KVM at Qumranet, a technology startup company that was acquired by Red Hat in 2008. KVM was merged into the Linux kernel mainline in kernel version 2.6.20, which was released on 5 February 2007. KVM is maintained by Paolo Bonzini. Set up the guest VM's address space. The host must also supply a firmware image (usually a custom BIOS when emulating PCs) that the guest can use to bootstrap into its main OS. Feed the guest simulated I/O. Map the guest's video display back onto the system host. On Linux, QEMU versions 0.10.1 and later is one such userspace host. QEMU uses KVM when available to virtualize guests at near-native speeds, but otherwise falls back to software-only emulation. Internally, KVM uses SeaBIOS as an open source implementation of a 16-bit x86 BIOS. Virtual Machine Manager – supports creating, editing, starting, and stopping KVM-based virtual machines, as well as live or cold drag-and-drop migration of VMs between hosts. Proxmox Virtual Environment – an open-source virtualization management package including KVM and LXC. It has a bare-metal installer, a web-based remote management GUI, a HA cluster stack, unified storage, flexible network, and optional commercial support. OpenQRM – management platform for managing heterogeneous data center infrastructures. GNOME Boxes – Gnome interface for managing libvirt guests on Linux. ^ a b "Linux kernel 2.6.20, Section 2.2. Virtualization support through KVM". kernelnewbies.org. 2007-02-05. Retrieved 2014-06-16. ^ "FreeBSD Quarterly Status Report: Porting Linux KVM to FreeBSD". ^ "Gmane - Mail To News And Back Again". Archived from the original on 2007-09-29. Retrieved 2007-05-07. ^ "KVM wiki: Guest support status". Retrieved 2007-05-27. ^ "Running Mac OS X as a QEMU/KVM Guest". Retrieved 2014-08-20. ^ "status". Gnu.org. Retrieved 2014-02-12. ^ "Guest Support Status - KVM". Linux-kvm.org. Retrieved 2014-02-12. ^ "OpenBSD man page virtio(4)". Retrieved 2018-02-04. ^ "virtio binary packages for FreeBSD". Retrieved 2012-10-29. ^ "NetBSD man page virtio(4)". Retrieved 2013-07-15. 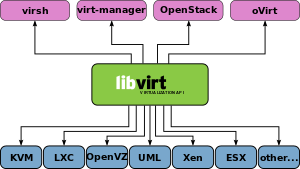 ^ "An API for virtual I/O: virtio". LWN.net. 2007-07-11. Retrieved 2014-04-16. ^ "SCSI target for KVM wiki". linux-iscsi.org. 2012-08-07. Retrieved 2012-08-12. ^ "Red Hat Advances Virtualization Leadership with Qumranet, Inc. Acquisition". Red Hat. 4 September 2008. Retrieved 16 June 2015. ^ Libby Clark (7 April 2015). "Git Success Stories and Tips from KVM Maintainer Paolo Bonzini". Linux.com. Retrieved 17 June 2015. ^ "SeaBIOS". seabios.org. 2013-12-21. Retrieved 2014-06-16. ^ "Introducing Virgil - 3D virtual GPU for qemu". 2013-07-18. Archived from the original on 2013-07-25. Amit Shah (2016-11-02). "Ten years of KVM". lwn.net. Retrieved 2017-02-10. This page was last edited on 8 February 2019, at 15:51 (UTC).